We love to hear from you . Please use the comment section at the bottom of this page and to enlarge any picture just click on it. 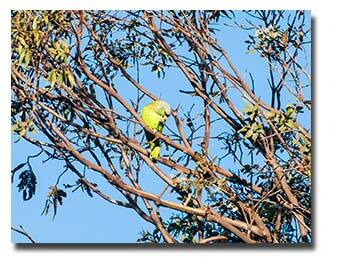 Thank you for visiting our web site and your interest in the Wild Parrots of Santa Barbara. 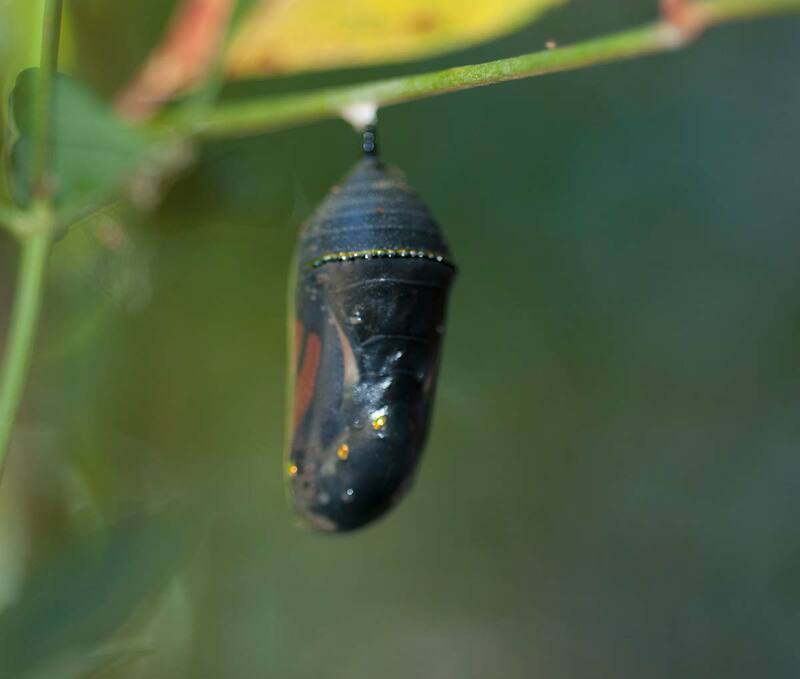 The first bit of news that everyone wants to know is how many we now have? With some difficulty we have counted thirteen individuals at our last full flock sighting. This is disappointing as this is the same quantity we started with in 2012 plus one baby. A normal year would see 3 babies. We monitored at least six fledglings in the last two years but only two have survived plus we lost four older birds. 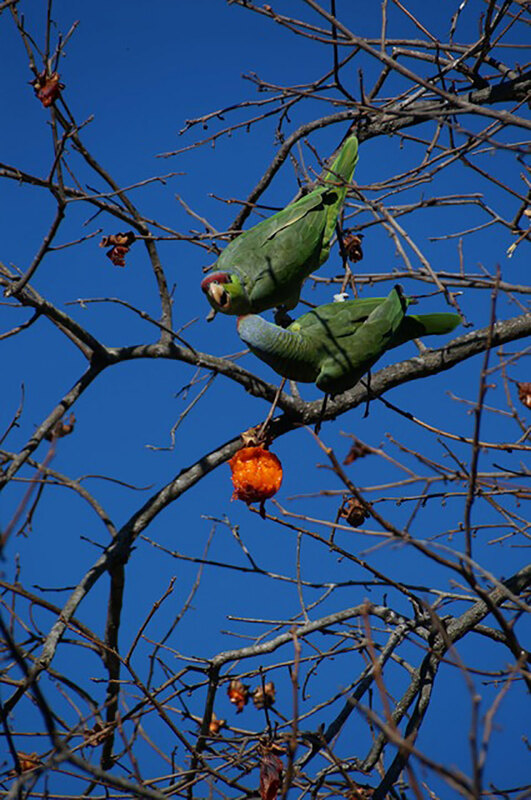 We have reported this count to the annual World Parrot Count, documenting the urban parrot flocks around the world. 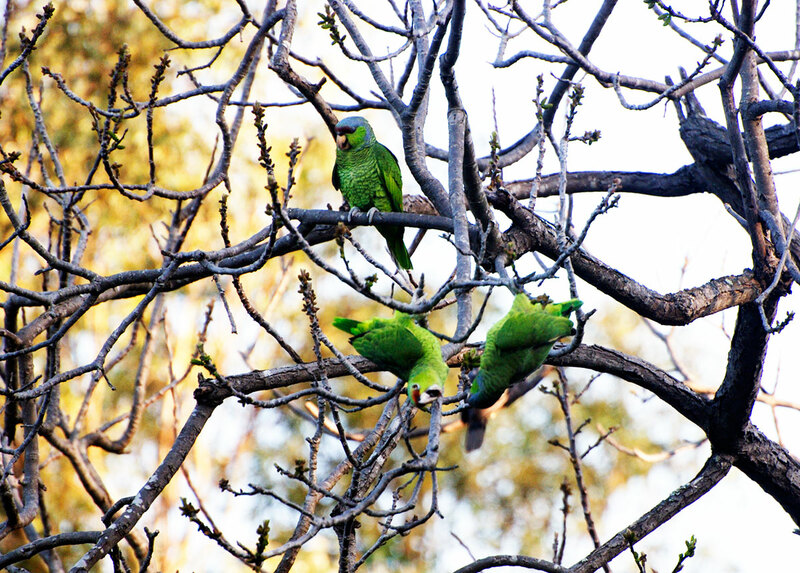 Should you be interested in learning more please visit http://cityparrots.org/world-parrot-count/. One prominent flock member that we lost was the beautiful female hybrid who we called Little Loupe. She was a cross between a Double Yellow Head male amazon and Lilac Crowned female amazon. She will be missed. Her two hybrid offspring are very difficult to identify when the flock has landed as they appear almost identical to the other Lilac Crowned flock members. These two can be identified when the flock is in flight as two birds with slightly larger wings. There is also a very slight bit of yellow on their heads which may develop more as they age. 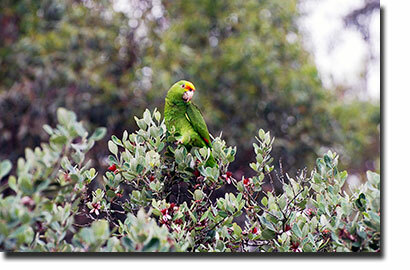 The flock continues to roost at their Montecito location and then have daytime foraging visits to the San Roque area. 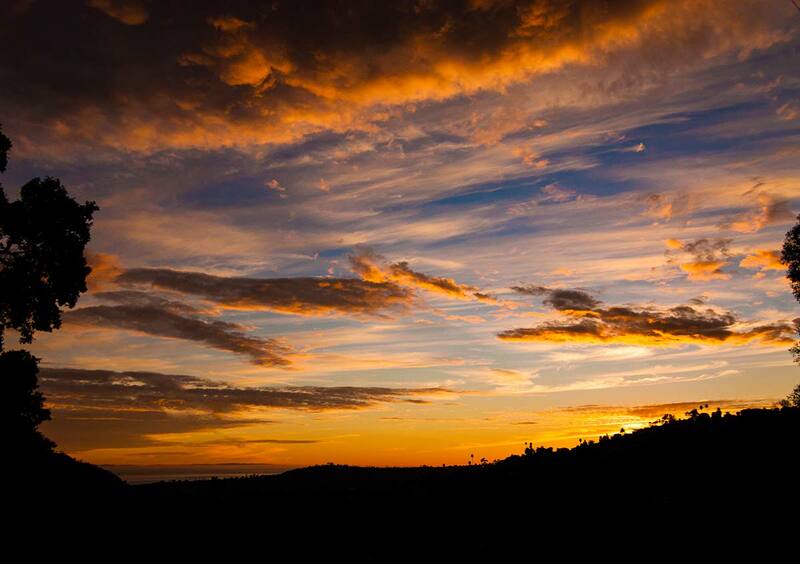 We appreciate the sightings and details that many of you have sent to us including pictures. 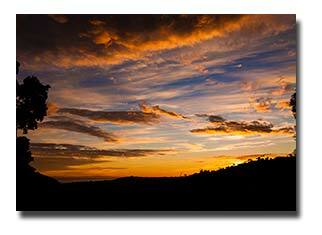 I will give photo credits should your pictures be used. 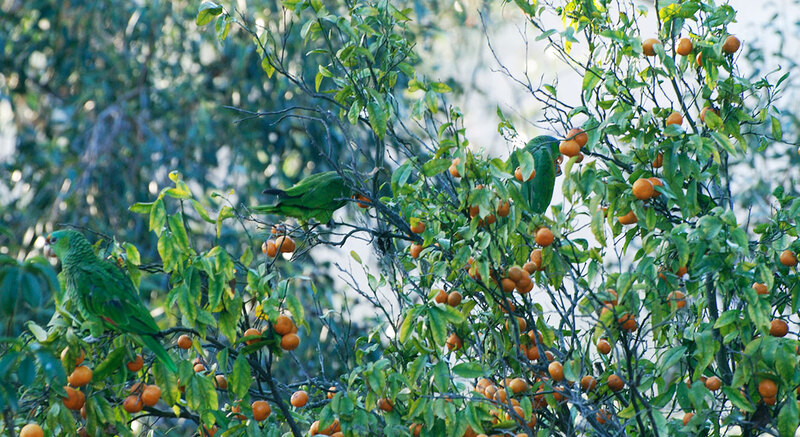 Oranges, loquats, apples plus pineapple, strawberry and lemon guavas make up the majority of foraged fruit. A special treat are new flower buds from Majestic Magnolia trees. We have learned that in other SB areas they can be found eating Passion Fruit, Cocoa pods and Persimmons. We continue to receive inquiries about the origins of the Santa Barbara flock of parrots so will keep the history below for every future update. Where did the SB parrots come from? Over the years we have entertained several explanations, they are escaped pets, smugglers released their captives while being pursued by law enforcement and that the Santa Barbara Bird Farm released them during the 1977 Sycamore Canyon fire. It is interesting that these same stories with different characters are used to explain the wild parrots found in most California locations. 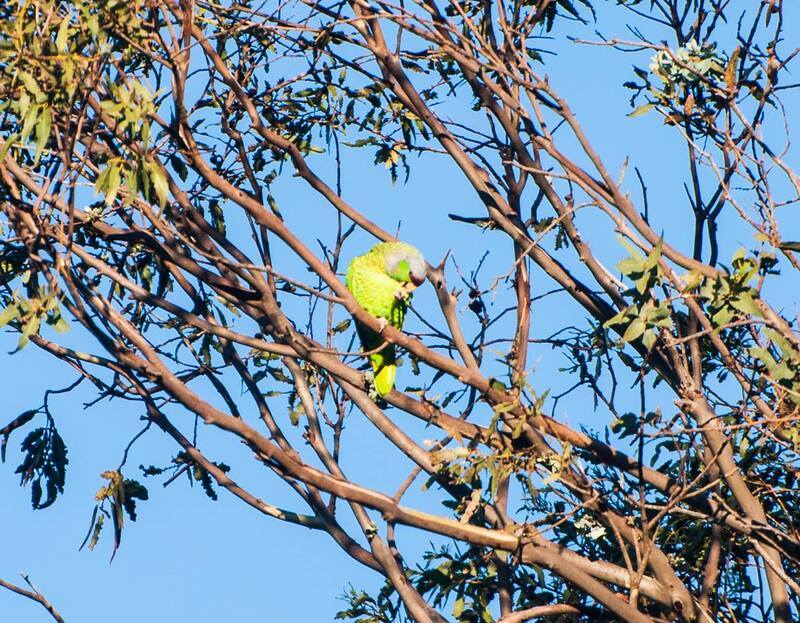 The Conures of Telegraph Hill have been confirmed as escapees mostly through sightings of their leg bands and the Nanday Conures found in Malibu are surely from escaped or released pets. The fire and release story for the Santa Barbara flock is not correct, we did not release any birds during the fire and also did not have amazons at that time. 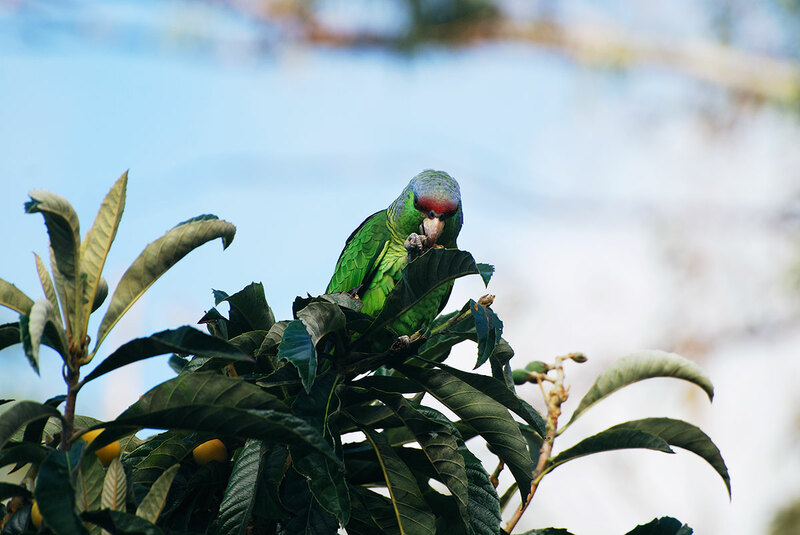 The wild parrots that make up our flock, primarily Lilac Crowned Amazons were here and well established in 1975 when we relocated the bird farm to its current location. At that time there were seven members to the flock. This number has fluctuated from a maximum of seventeen back in the early 80s and now down to thirteen. Through the years the challenge to their existence has been demonstrated with a low of only 6 birds in 2002. Several escapees have joined the flock but their survival is relatively short. 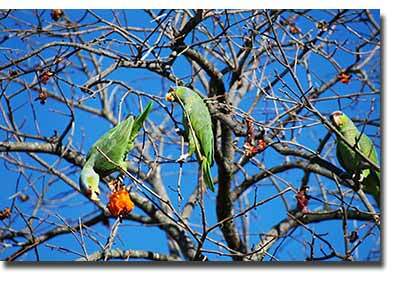 The one exception, a Double Yellow Headed Amazon joined the flock in the late 80s. He paired with a Lilac Crowned hen who had previously been mated to the flock leader. The timing was crucial as the flock leader had been captured by a local breeder just before the arrival of the DYH. The DYH immediately took control of the leaderless flock and established order. The flock grew in numbers. He produced offspring for approximately 14 years until his 1999 disappearance. It should be noted that each year there is an average of 3 babies raised in this flock. With the flock starting at 7 birds in 1975 and now 40 years later there should be well over 100 flock members. Their survival is highly challenged. These birds that have benefited from increased human introduction of additional food and water sources. The SB flock has acquired an appetite for the local, abundantly available fruit. On the other side they lost suitable, preferred nesting sites from the continued removal of long lived trees such as Eucalyptus and Oaks. The suggestion that these birds originated from escapees who learned to survive is difficult to support. None of the birds with the exception of the Double Yellow Head has ever demonstrated prior human contact. The release by smugglers is improbable. Smugglers will immediately clip the wings of captured birds to prevent escape. 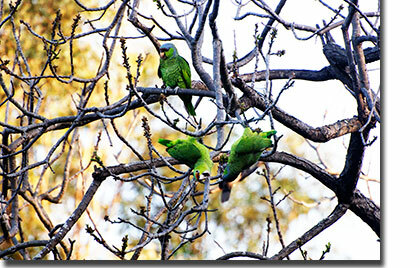 After studying these wild parrots we are considering another possible explanation, they were always here. 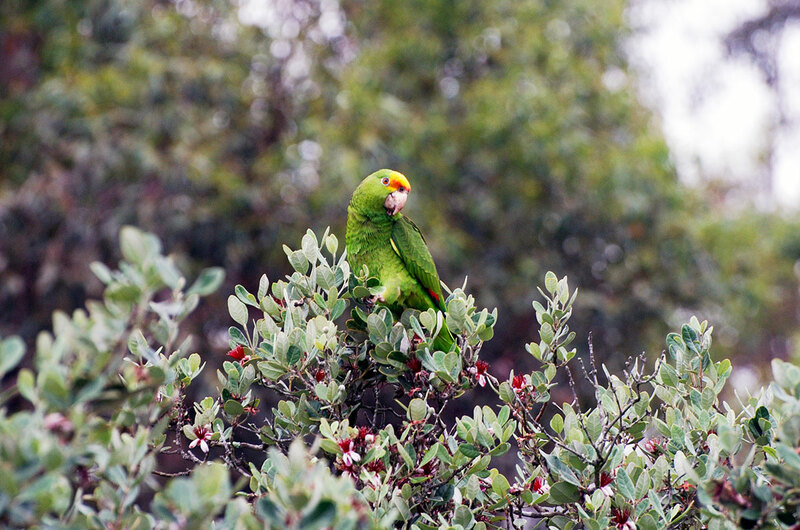 Of the California wild parrot flocks Santa Barbara is host to the northernmost and smallest flock of these LC Amazons. Larger flocks are found further south in Pasadena, East LA and San Diego. But these flocks have been substantially altered by random escapees and released pets. Unlike our isolated flock they cannot be studied as a homogeneous flock. We have also noted that the Santa Barbara LCs have a much deeper maroon coloring than the birds that had been imported from Mexico suggesting a possible variation from the dominant species just south of the border. Perhaps a past El Nino created a short-term migration north, we will never really know. Please enjoy the photos below and as always your comments and questions are greatly appreciated. 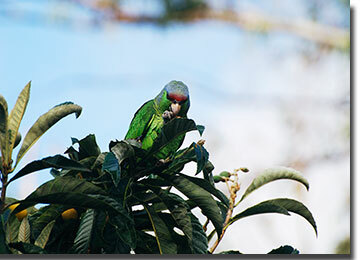 If you should have pictures of the wild parrots and wish to share them we will try to include them in future updates with the pertinent information and credit to you. To enlarge, please click on the image. To return use your back command. 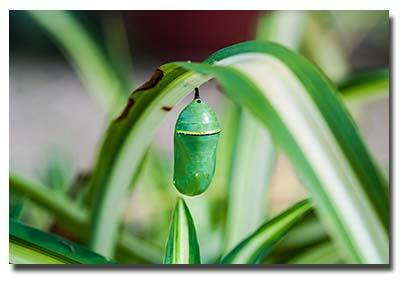 Santa Barbara hosts our beautiful wild flock of parrots and also hosts an abundance of Monarch butterflies. 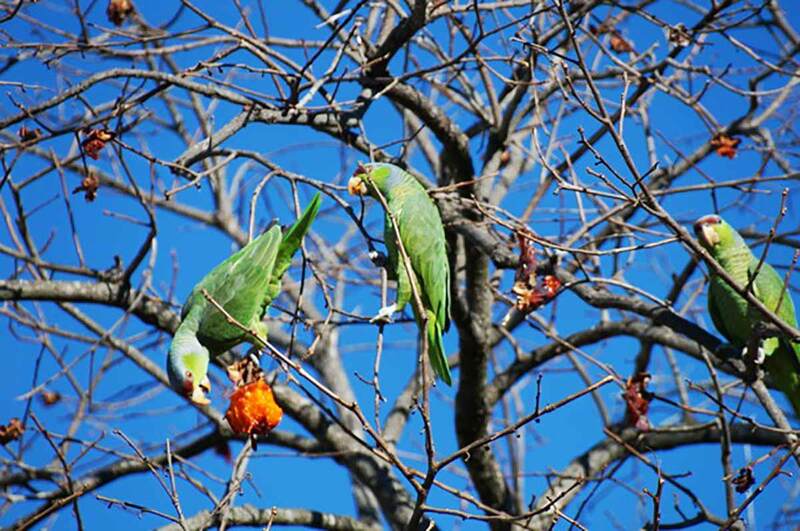 The wild flock love Persimmons and have decimated this tree. 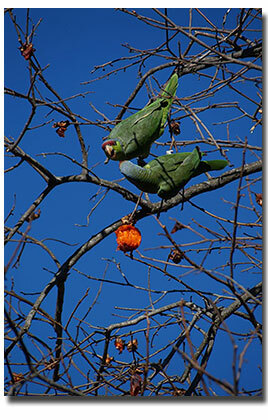 Two Lilac Crowned squabble over the last Persimmon. 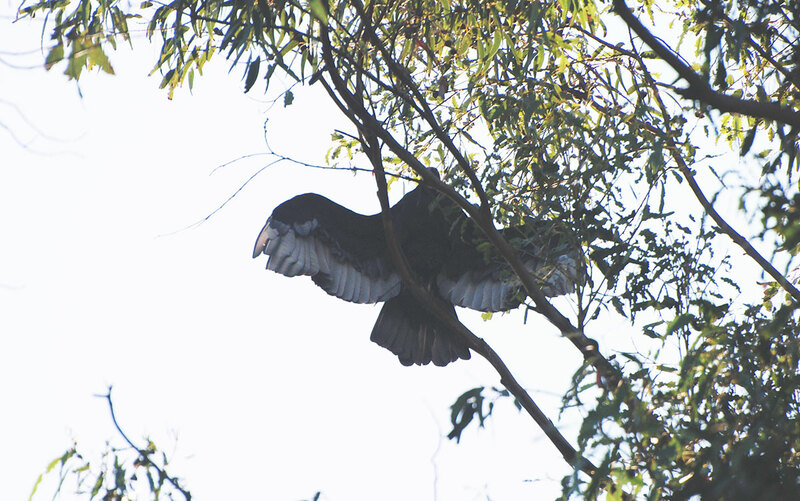 A family of Vultures took up residence in the local trees. 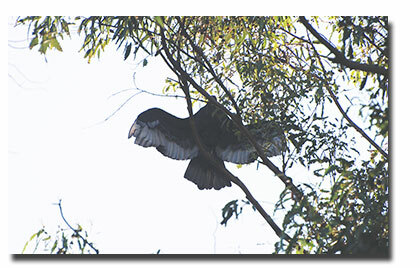 The parrots definitely reduced their visiting times while the Vultures were sunning their wings. 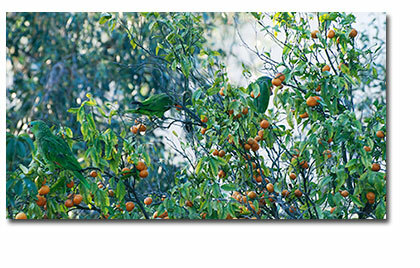 Three Lilac Crowned foraging on Mandarin oranges. Two youngsters play while dad looks on. Lilac Crowned finding a choice Loquat. In early morning the flock leader will often fly into the surrounding trees to confirm there are no hawks before calling in the flock. All content copyright 1999, Santa Barbara Bird Farm. Reproduction of any kind without written consent is prohibited.